In this Photoshop Effects tutorial, we're going to look at how to give a photo a gritty, overprocessed look to it with extreme levels of contrast and sharpening, noise and washed out colors. Part of the effect will be created with a technique normally used as an advanced way of sharpening an image, but in this case, we'll be taking things well beyond the boundaries of common sense. This is the sort of thing that would probably get you fired if you were supposed to be doing serious photo editing and retouching work, but I've seen this photo effect used time and time again in advertising, and while the final result looks rather harsh, Photoshop makes creating the effect quick and painless, as we'll see! Photoshop Photo Effects: The final effect. A copy of the Background layer now sits above the original in the Layers palette. Go to Filter > Other > High Pass. This brings up the High Pass filter dialog box, and you'll see your photo in the document window become filled with gray. 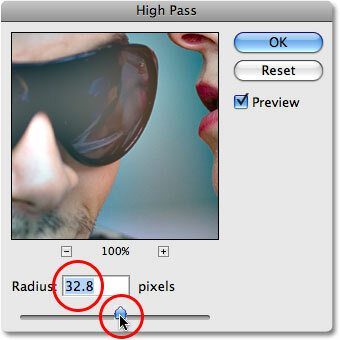 If you want to learn more about how to use the High Pass filter for image sharpening, be sure to check out our Sharpen Images With The High Pass Filter tutorial in our Photo Editing section, but just to quickly summarize, if you look down at the bottom of the dialog box, you'll see the Radius option. If we were using the High Pass filter to apply a normal amount of sharpening to our image, we'd want to keep the Radius value very low, usually somewhere between 1-2 pixels. At this low setting, only the edges of objects in the photo become visible, while the rest of the photo remains solid gray. This allows us to sharpen only the edges of objects, leaving the rest of the photo unsharpened, which usually gives us great results. Drag the Radius slider to the right until you can clearly see your photo behind the solid gray color. The image after applying the High Pass filter. Step 3: Change The Blend Mode Of The Layer To "Hard Light"
Change the blend mode of "Layer 1" from "Normal" to "Hard Light". The image after changing the blend mode of "Layer 1" to "Hard Light". Step 4: Duplicate "Layer 1"
A copy of "Layer 1" appears at the top of the Layers palette. The contrast in the photo has been increased after duplicating "Layer 1". Duplicate the layer again if needed to add even more contrast to the image. Lower the opacity of the new layer if the contrast appears too intense at this point. The image after duplicating "Layer 1" a second time. Hold down Alt (Win) / Option (Mac) and click on the New Layer icon. The New Layer dialog box. Change the blend mode of the layer to "Hard Light" and select the "Fill with Hard-Light-neutral color (50% gray)" option at the bottom. A new layer set to Hard Light and filled with gray appears in the Layers palette. Add a small amount of noise to the image to give it a grainy appearance. The image after adding noise. 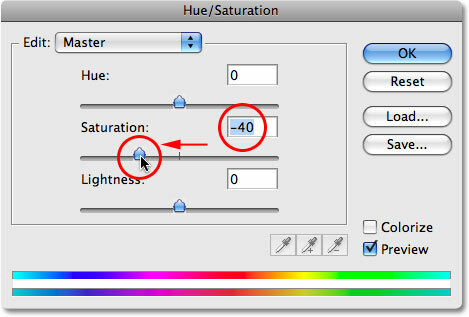 Select a "Hue/Saturation" adjustment layer. Desaturate the color by dragging the Saturation slider to the left. And there we have it! That's how to create a gritty, overprocessed image effect with Photoshop! Visit our Photo Effects section for more Photoshop effects tutorials!